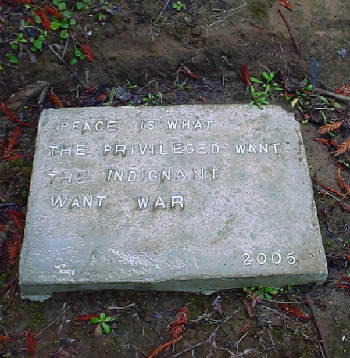 Peace is what the privileged want. The indignant want war. I consider myself privileged. Not because I am wealthy. I am not. Not because I have power to control others. I have no such power. I am privileged because I am not in pain, I am not disabled physically and I am not in financial need. To be so blessed is privileged. And I want peace in order to preserve this good fortune and not lose this precious condition to the chaos of war. We who have the privilege of well being – we want peace. Who wants war? Who are those motivated to do battle? Who can be mobilized into a fighting force? In what lies the motivations to fight? The motivation to join a battle unit. Romance – to fight alongside comrades for a worthy cause. Gain – remuneration, the spoils of war. Anger – to wreak destruction on an unjust world. Indignation for wrongs that must be righted. Righteousness – to impose what is right. The stepping stone’s words imply that peace is not a universal good. It benefits the privileged peaceful. But the indignant, seeing great wrongs in society, view war as good. They see it as necessary to oppose evil. Is it not a good to fight against wrong? Not everybody wants peace. There are always warriors among us. The poor and deprived need such champions. These words are angry ones. They are the words of war. Who says such words considers himself a victim! The victim of those who are ‘privileged.’ Victims of oppression. Exactly from these emerge the indignant warriors among us. The ones ready to do battle to right wrongs. The ones who want war. Renowned books on how to attain or keep power are by Machievelli, (The Prince) by Sun Tzu (The Art of War) and by Saul Alinsky. Alinsky (1909-1972) was an effective organizer and radical and he wrote the book, Rules for Radicals (1971) N.Y. Over the years this has become scripture as a handbook on the mechanics for achieving power. Extremists and radicals of both the left and the right pay attention to its teachings. The nobility and grandeur of his motivation is evident. Alinski’s words are stirring. His catalogue of evils resonate with us. We know its truth. His righteous indignation drives people to join him. Ah, how sweet are the words of demagoguery. Let us suppose that Alinsky managed to ‘seize power’. How would he ‘give it to the people’? How are the people, in fact, to wield power? How is the beautiful dream to be effected; if Alinsky had the chance to effect it? Alinsky never tells us. He doesn’t address this ultimate and critical concern; how he would use power as no other before him has done – to produce ‘good’. His thrust is on getting power. He spends pages in moral outrage enumerating the injustices he finds – the Vietnam war, “racist discriminatory culture”, strip mining for coal … And then moves on to his contribution: How to organize constituents into a force with which to be reckoned. How to build a base for power. The mechanics of acquiring power. How to play and win at this game is what his activist devotees derive from Alinsky. Significantly he writes in his chapter on means and ends. So here is the picture being painted: We live in a faulted world where all efforts to bring about a better world have, heretofore, failed. Nevertheless, Alinsky aims to bring it about by gaining power. Power can bring about the good world that “should be”. And the achievement of power must supersede concerns about scruple. When close to the battle-for-good, matters of ethics are a distant concern, says Alinsky in agreement with Goethe. In the pursuit of a great dream, doing evil in the service of good is permitted. With precisely this outlook Lenin, in the Russian revolution of 1917, created the ‘dictatorship of the proletariat.’ Dictatorial rule. Proclaimed for the good of the people. In fact, it oppressed them. Noble goals, ignoble consequences. Can ‘good’ be objective. Clearly, Alinsky thought so. But surely ‘the good’ is a subjective notion. We don’t know what ‘the good’ is. All we know is ‘what we want’. We call that ‘good’. This is precisely Alinsky’s complaint. He cannot abide the subjectivity of good. He wants to bring objective good about. And to do so he is willing to abide evil. The symbiotic incompatibility between good and evil is the subject in this essay called Peace and Justice. The picture is by Rudi Herzlmeier whose whimsical work I admire greatly. I wrote to him for permission to use this image but I never got an answer.